© BristolRE2007 - Peter Horrex. M221EAF was one of the very early low floor buses. It was operated by Western National with funding from Devon County Council and ran in the wonderful badger n flags livery. 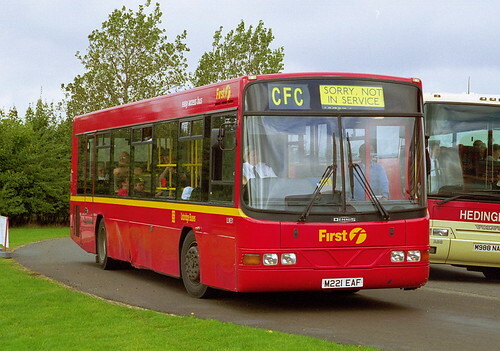 It has since then gone on to Centrewest (First London) and I believe its currently up with First Midland Red? It was purchased for the 118 service from Tavistock to Barnstable. This was later replaced by the 86 from Plymouth. Later this year FDC withdraw the 86 and the service reverts back to 118 from Tavistock and will be operated by Hookways Coaches. Quite what it will use on the service remains to be seen! Do you have a date for the changes to Service 86 ?